An annual report on Brazil’s biofuel sector has been filed with the USDA Foreign Agriculture Service’s Global Agricultural Information Network, predicting Brazilian ethanol production will increase 5 percent next year, reaching a total of 26.9 billion liters (7.11 billion gallons). Ethanol exports are expected to increase 200 million liters next year, reaching 1.8 billion liters. Regarding Brazilian policy, the report indicates that the government of Brazil is expected to pay sugarcane growers in the Northeast part of the country that have been impacted by a severe drought approximately R$170 million ($75.1 million). The Brazilian president, however, has not yet signed a bill that would allow those funds to be released. The ethanol blend level in Brazil is currently set at 25 percent. According to the report, the Sugar and Alcohol Millers Association of Sao Paulo State (UNICA) has requested the blend be increased to 27.5 percent. While the government has conducted technical studies on increasing the blend, those results aren’t expected until late September. Even if the studies recommend an increase in the blend level, the GAIN report indicates it is unlikely the new blend level would come into effect before the end of the year. According to the report, Brazil is expected to produce 25.61 billion liters of conventional ethanol this year, down slightly from 27.54 billion liters in 2013. Production is expected to increase to 26.86 billion liters next year. Brail is also expected to produce 20 million liters of advanced ethanol this year, increasing to 162 million liters next year. Brazil is expected to import 360 million liters of fuel ethanol this year, up from 131 million liters last year. In 2015, imports of fuel ethanol are expected to increase slightly, reaching 400 million liters. Fuel ethanol exports are expected to reach 900 million liters this year, down from 1.95 billion liters in 2013. 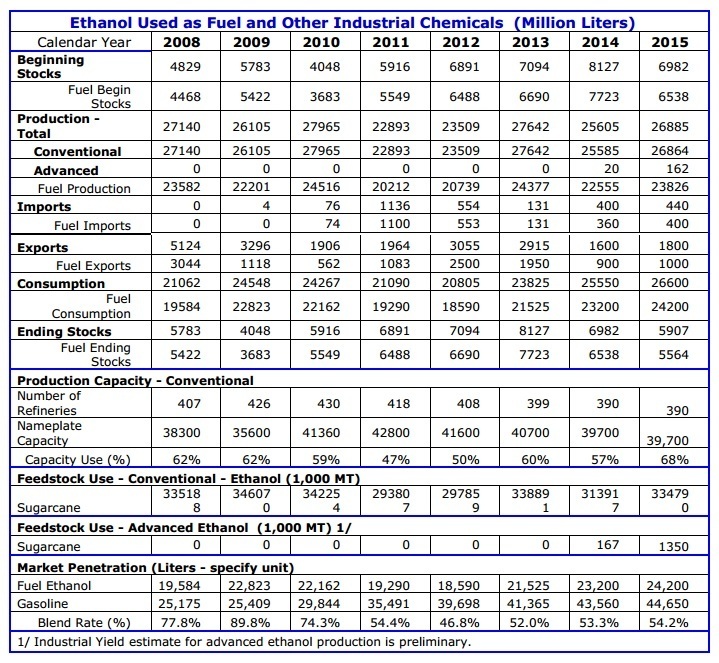 The report forecasts that fuel ethanol exports will increase to 1 billion liters in 2015. The report indicates that Brazil currently has 390 ethanol refineries, down from 399 last year. The number of ethanol plants is expected to hold steady into 2015. Nameplate capacity is currently an estimated 3.97 billion liters with 57 percent of capacity in use. In 2013, Brazil had an estimated 40.7 billion liters of capacity. While capacity is expected to be maintained at the 2014 level next year, capacity use is forecast to increase to 68 percent. According to the report, one advanced ethanol refinery with 82 million liters of production capacity is expected to come online this year. In 2015, the report estimates three advanced ethanol plants will be in operation in Brazil, with 162 million liters of combined capacity. The U.S. is Brazil’s largest export market, with an estimated 1.66 billion liters ethanol exported to the U.S. last year. South Korea, the Netherlands, Japan and Jamaica round out the top five export locations for Brazilian ethanol. Brazil imported more ethanol from the U.S. than any other country last year, with 131.2 million liters imported. Overall, Brazil imported 131.71 million liters of ethanol last year. A full copy of the report is available on the USDA website. Notera kapacitetsutnyttjandet, runt samma som i Europa men lägre än i USA.